I've been working on two elements for Championship Formula Racing over the last couple of months: weather and automated opponents. Weather is something that others have taken stabs at. So this isn't totally new ground. But it is something Jim and I wanted to have as an optional rule for Championship Formula Racing. I've thought about weather before and failed to come up with anything I really liked. I had set it aside for a while but picked it back up again recently. 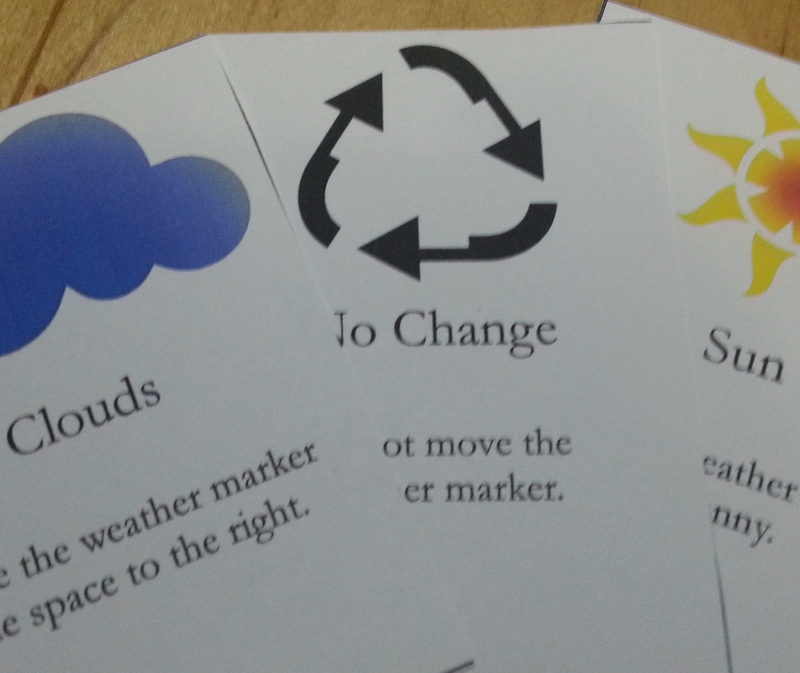 The three card types that form my weather deck. My primary goal with my weather system is to keep it from becoming just a random event with no strategic element to it. In real F1 racing, impending weather adds an element of strategic gambling. Do I come in early for wet weather tires or stay out as long as I can on dry tires? If I know the day before that it is likely to rain, do I set up my car accordingly or not? So I realized early on that I needed some sort of predictive element to weather. A way for drivers to see the odds of weather affecting the race next lap and be able to do something about it (ie. pit for different tires). That way weather became a strategic decision point not just a random factor -- even if it is playing the odds at best. I think I have something that does that. But it needs play testing. I'll elaborate later on what I have so far. 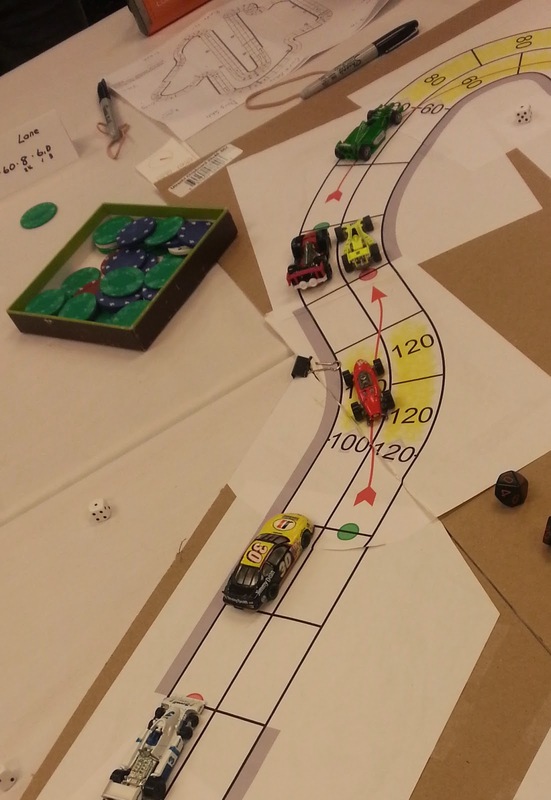 More recently I've been tinkering with a set of rules that would allow you to race against automated opponents. The idea came from Jim who wanted to let people race against their favorite historical greats. 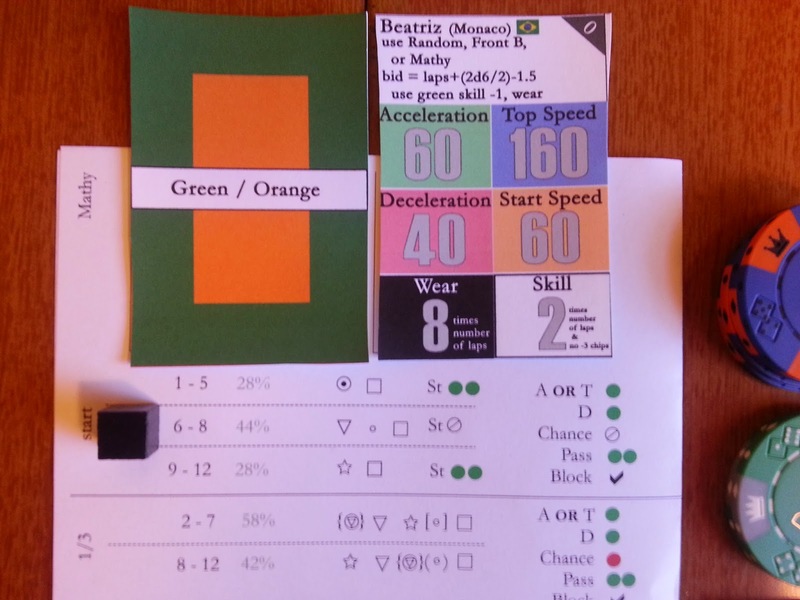 First I needed a system for automating the tactical and strategic decisions of the game. Not perfectly, but credibly enough that it would be fun to race against -- maybe even challenging. I'm currently tinkering with a system where 6 possible tactics are determined semi-randomly for each automated driver based on their over all strategy. Those tactics correspond to different speeds marked on the side of the track for that row of space. Its worked well enough that I ended up running a 6 car race of all automated cars until 1 am Sunday night because I lost track of time. I've also started researching which drivers I might want to model and how I would model them. I think the biggest challenge with this system is to make sure it is easy enough that someone other then me can do it. I'll try to get into this more in my next update as I've been testing it every night for almost a week now. Testing auto-piloted cars on Monaco. Almost 2 months ago, Jim Dietz at Jolly Roger games emailed me out of the blue. 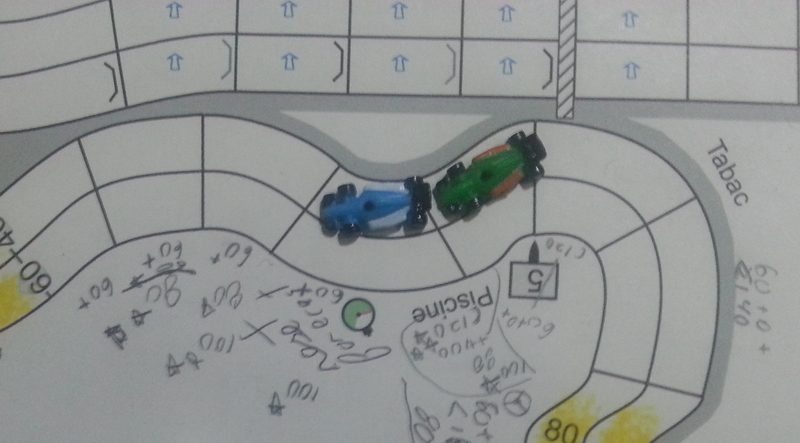 We had a very quick email conversation that resulted in plans to publish Championship Formula Racing based on my house rules to the game people know as Speed Circuit. I'm going to spend a lot of time on this blog talking about Championship Formula Racing, how it came to be, why I made different decisions over the years, and what's going on right now. Consider this post to be issue 0 -- the origin story. As a kid I probably played more board and card games than most American Gen-Xers. Mom, Dad, and I played a lot of hearts because it was a card game that worked very well with 3 people. We also had some of the Avalon Hill bookcase games: Twixt (pretty cool), Wilderness Survival (I never remember getting very far in that game), and other games of that ilk. Most importantly we had a copy of Speed Circuit. I really liked that game and we played a fair bit of it. Almost always Monaco, with just the 3 of us, for 1 lap. I also got into role playing and that took over most of my game playing life from high school through college. Soon after college Magic the Gathering took over parts of my time and wallet. I didn't play Speed Circuit again for many years. Then I got back into it by chance. My first real job out of college I ended up working at the U.S. Navy Memorial. My boss at the time wanted to start a naval themed gaming convention to attract people to the visitor center and I joined him for a day one summer at Avalon Con. I mostly played in open gaming that day but spent a good bit of time wandering around to see what everyone was playing and how things were set up. And there is was -- back in a dark corner of the hotel next to the room where the Klingons were practicing their ritual dances -- they were playing speed circuit. But this was only nominally the game that I grew up with. Rob Cunningham ran the tournament then and he had his own custom rules bolted on to the Speed Circuit chassis and used 1/48 scale model cars and custom built tracks at the same scale and 3 lap races with 14 or so cars in each race. It really was like a completely different game. And I loved it even more. I came back the next summer and many, many summer after that. I also started up a local group and started building my own tracks at 1/64 scale (because matchbox cars are 1/10 the price of 1/48 scale cars... at least). One year Rob stopped running the tournament at Avalon Con and I took up the reins. 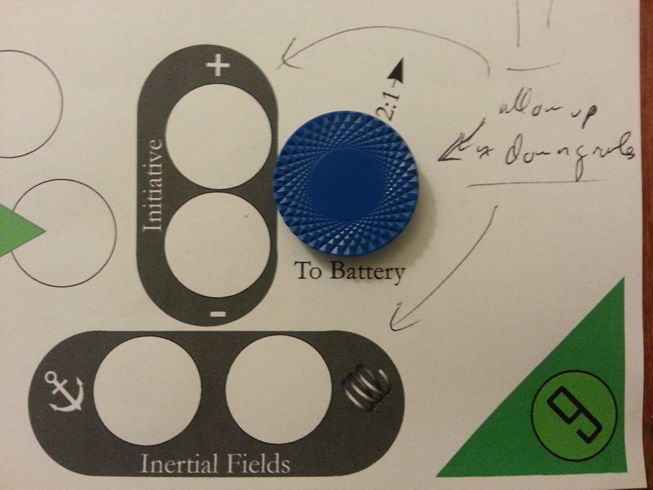 I suppose this is the point at which I became one of the many nodes of speed circuit out there. Unlike a lot of other board games, speed circuit has evolved and branched over time into multiple related games. A good friend of mine recently compared it to card games. There are more variations and versions of poker then any one person could probably enumerate but they all share a recognizable core. Same with Bridge and Rummy and other games like that. Monopoly kind of has this given the fair number of house rules that people play with. 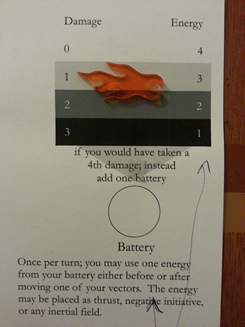 But I can't say that I have seen this effect with many hobby board games. There are a lot of Speed Circuit camps out there that have a set of rule modifications that they like. Just like how some people prefer Texas-Hold-Em to 5-Card-Draw or 7-Card-Stud. Even the Avalon Hill version of speed circuit was a pretty serious modification of the original 3M game and there are those who prefer the 3M version as their jumping off point. Over 15+ years of modifying and tweaking rules, my list of roughly described modifications is longer than the complete Avalon Hill rules for the game. I suspect most others who have heavily modified rules sets could say the same thing. Don't stray too far from the path -- I want people to recognize the core mechanics. Accommodate ~10 drivers per track. Balance simulation desires with game play realities. Generally make multiple different strategies workable. Subconsciously, I've also hewn to the American style of direct knife fighting as opposed to the more gentlemanly European model. It seems like a slight thing but the difference between just finishing first and driving as quickly as possible has knock-on effects throughout the game. If you've played at Avalon Con or WBC or in my PBeM or the official WBC PBeM, you've played Championship Formula Racing and just not known it. And you've contributed to it's evolution to where it is today. So thank you and welcome to the ongoing story of that game.